Despite a tough Varsity Football season, Wits ended on high by winning their final group game. Wits lost their penultimate game of the Varsity Football season on Monday night, going down 1-0 to Tshwane University of Technology (TUT). A second-half strike by Keabetswe Mokwena sealed the win for TUT, who will head into the semi-final stage of the tournament as the only unbeaten team in the competition. Wits, on the other hand, has won just one out of six games this season, beating Central University of Technology 2-0 in round 3. The tournament got off to the worst possible start for Wits, losing 6-0 to the University of Western Cape on July 27, before suffering a 4-1 defeat to North West University a week later. Wits coach, Mark Haskins, said that those games set the tone for the tournament and came as a shock to the side, which was hoping to the win the competition. 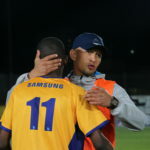 Wits assistant coach, Alzavian van Rheede consoles player, Thabiso Rafanyane after their 1 – 0 loss to TUT. “We believed that we had a good enough team to be able to challenge the top sides in the tournament, but it’s hard to put a finger on what went wrong”, said Haskins. Haskins added that, “We only have ourselves to blame.” He fingered a lack of desire and intensity in many of the games. Tactically, Haskins said that the team was vulnerable on the counter attack throughout the tournament and conceded too many goals from lapses in concentration. Mahle Matabane, a midfielder with Wits FC echoed his coach’s sentiments, saying that the team could have showed a lot more hunger. “We lost to other teams, not because they were better than us, but because they wanted it more. That was the difference this year. It’s like we didn’t have the desire to win,” he said. Haskins and Matabane both said that the morale in the team suffered as a result of their performances and that the losses definitely affected the team. Despite having a tough campaign, Haskins said there are positive things that the team and coaching staff can take away from the tournament. “There are a lot of young players in the team, in first and second year, and the coaching staff is also relatively young , so all we can do is learn from our mistakes and try to do better next season,” said Haskins. Wits ended their season with a 2-1 win over University of Fort Hare on Thursday, September 7. Wits Vuvuzela, Wits positive about winning Varsity Football, July 19, 2016. Wits Vuvuzela, Varsity Football launch, July 26, 2017.